Luce would die for Daniel. And she has. Over and over again. Throughout time, Luce and Daniel have found each other, only to be painfully torn apart: Luce dead, Daniel left broken and alone. But perhaps it doesn’t need to be that way. . .
Luce is certain that something—or someone—in a past life can help her in her present one. So she begins the most important journey of this lifetime . . . going back eternities to witness firsthand her romances with Daniel . . . and finally unlock the key to making their love last. Cam and the legions of angels and Outcasts are desperate to catch Luce, but none are as frantic as Daniel. He chases Luce through their shared pasts, terrified of what might happen if she rewrites history. Because their romance for the ages could go up in flames . . . forever. I always enjoy reading the books in the Fallen series. Passion is no different. It was a really engrossing read with characters that I’ve loved since the beginning. In this book, Luce goes searching in her past lives to find a way to help her present life, to find a way that she and Daniel can be together forever. In each past life that she visits, she observes the romances between herself and Daniel, and she sees just how deeply his love for her goes. As Daniel and the other fallen angel’s chase her through time, it’s up to Luce to find a way for their love to last. I have to say, Luce drove me a little crazy in this book. How much proof did she need that Daniel loved her? The further back in history Luce went, the more she could see how strong Daniel’s love for her was. She never should have doubted him that. (However, we wouldn’t have had this book if that was the case.) Daniel, in all his lives, was so wonderfully charming and romantic. I could definitely feel his frustration as he chased Luce through time. I really enjoyed the back-history in this story. Not only getting to see Luce and Daniel’s previous lives, but we also get a little history on some of the other fallen angel’s as well; Roland, Cam, Gabbe, etc. It was really great to see parts of their history as well. Overall, I really enjoyed all of the characters and the history that was included in this novel. I love this series, and can’t wait to get my hands on the next book; Rapture! This is my favourite in the Fallen series so far. I loved all the historical detail. Can't wait to see how the series ends! Luce drove me crazy with the whole "how can be love me, I need proof" thing. I am pretty sure he has already proven it. She was also a little too trusting in this book....especially when it came to a certain someone. I loved the backstory as well, especially the other angels. Great review, and hopefully Rapture gives us a fantastic ending. For some reason I can't remember, I was really turned off to this series in the first book and haven't picked up any more. Maybe I should give it another chance, though I fear I'd get frustrated with the MC and her doubting ways. 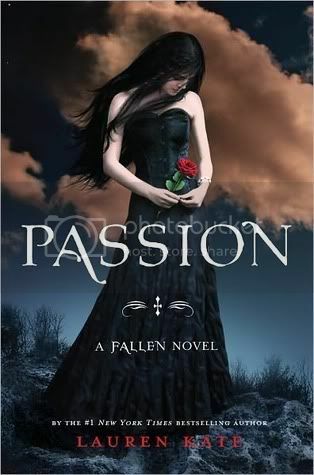 I just bought Fallen and I know that this series had many fans. I just love the covers! I'm so far behind on this series, I still need to read Torment! Luce is a tricky character for me, I liked her in Fallen but she did some things that drove me crazy as well, and it seems like that behavior might continue in these later books. Still a fan of the story overall though, so I'm hoping I get time to catch up soon. Thanks for the review Christy!